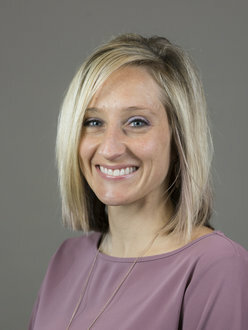 Amber Cloke became an Academic Advisor in the Academic Advising Center in September 2015 and serves as the liaison for the School of Health Sciences and Human Performance. Like all advisors in the Center, Amber is able and willing to assist all Ithaca College students with academic advising services. Amber is excited to be a member of the Ithaca College community and has a passion for student success. Amber holds a Master of Education in Higher Education Administration from the University of Delaware and a Bachelor of Science in Interior Design from Adrian College. While pursuing her education, Amber concentrated on accessibility and disability studies in higher education. Before beginning at Ithaca College, Amber served as the Assistant Director of the Career Center at Mansfield University where she assisted students in career planning, resume building, and job searching; her main focus was providing students with opportunities for success after college. Prior to her position at Mansfield, she served as the Academic Progress Advisor at Corning Community College. This position allowed her to serve at-risk students in academic advising, career planning, transfer planning, and academic success. In addition, Amber served as an adjunct faculty member for CCC's First Year Experience course. In her role as Academic Advisor, Amber is involved in the Ithaca College community. She teaches four courses offered through the Ithaca College Seminar (ICSM) Program. They are: ICSM 19000 Transfer Student Seminar, ICSM 170 Meeting the Challenges of Transition, ICSM 105 First-Year Seminar on Spirituality & Purpose, and ICSM 300 Principles of Peer Mentoring & Leadership. She also serves on the ICSM Steering Committee and the ICC Program Review Committee. Outside of her work at Ithaca College, Amber is grounded in her faith and enjoys running, being outdoors, and spending time with her husband & two young children.